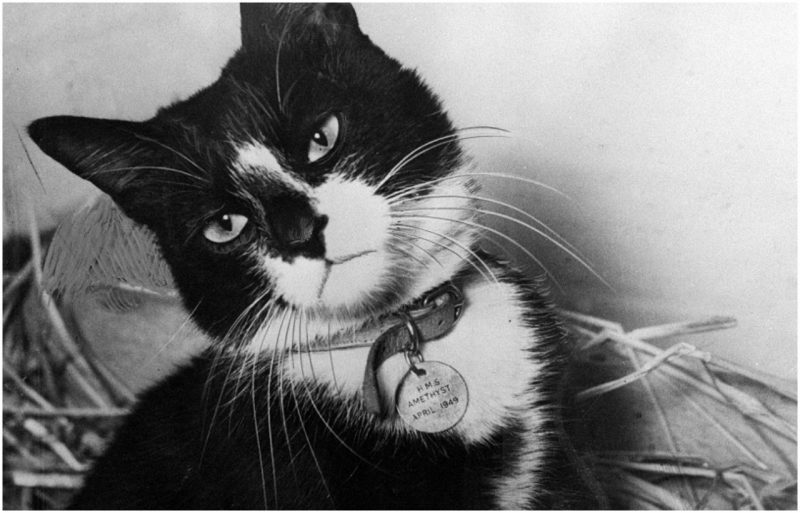 This is the story of how a black-and-white cat called Oscar served first the German Kriegsmarine and then the British Royal Navy during World War II, and how he survived three of those ships being sunk. The first was the Bismarck, a German flagship, and the most powerful naval vessel of the era. On May 18th, 1941, the Germans launched Operation Rheinübung, which was the Bismarck’s first and only mission; they were bound for the Baltic port of Gotenhafen, where they were assigned to waylay Allied convoys who were carrying vital supplies to the besieged Britain. But before she could wreak havoc, the Royal Navy administered a huge fleet to sink the Bismarck. After a battle that spanned over three days, the huge battleship was defeated and sunk. Of her crew, being more than 2,200, only 116 survived–that is, if you don’t count the black-and-white tabby cat, name unknown, who floated out of the wreckage aboard a stray piece of timber. Oscar’s, or Sam’s, (whichever you prefer) new home was a Royal Navy destroyer, a ship that was far more modest than the Bismarck. The crew spent the next several months escorting convoys in the Mediterranean Sea and the North Atlantic Ocean. The HMS Cossack was providing cover for a convoy going from Gibraltar to Britain, but in the process, she was severely damaged by a torpedo fired from a German submarine. Oscar and the crew were transferred to another destroyer, and an attempt was made to tow the crippled ship back to Gibraltar. However, this failed because of poor weather coming in, and they were compelled to severe the tow and leave the HMS Cossack sinking to its watery grave beneath the sea. Oscar was safely brought to the harbor in Gibraltar. Oscar’s next posting was on an aircraft carrier called the HMS Ark Royal. There he acquired his nickname “Unsinkable Sam”, given to him by sailors after they learned what had happened to him. Coincidentally, it was the Ark Royal that had formally played a crucial role in Sam’s transfer from the Kriegsmarine to the Royal Navy. The Bismark had been on the verge of escaping the Royal Navy pursuit when an ancient Swordfish biplane from the Ark Royal launched a torpedo that jammed the German battleship’s steering gear. This caused the Bismark to steam in a large circle and fall prey to the Royal Navy’s guns. 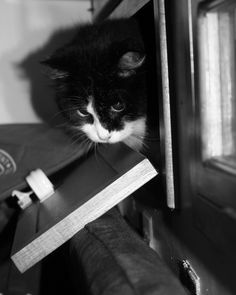 However, Sam’s time aboard the Ark Royal was exceedingly short-lived. The HMS Ark Royal, after several near misses, had gained the reputation as a ‘lucky ship’. But luck didn’t last; on November 14, 1941, the Ark Royal was torpedoed by yet another German submarine, in the Mediterranean Sea as it came back from Malta. Another towing attempt was made and failed, but all but one of the aircraft carrier’s crew was saved, and, of course, Sam too survived. After this third brush with death, it was decided that Sam should, in Navy parlance, “swallow the anchor” and complete his military service on dry land. He was first assigned to a desk job (his title was chief mouser) in the offices of the Governor of Gibraltar, the–absurdly named–Field Marshal John Standish Surtees Prendergast Vereker, 6th Viscount Gort. Unsinkable Sam expired in 1955. The National Maritime Museum in Greenwich, London, keeps a pastel painting of the famous cat in its possession. 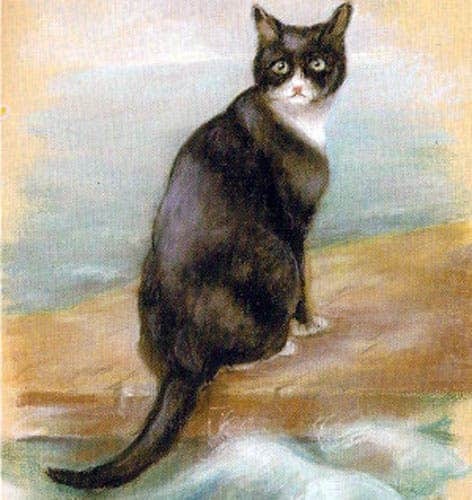 The artwork was done by Georgina Shaw-Baker and titled “Oscar, the Bismarck’s cat”. I hope you liked this :). I’m planning to do more blog posts about animals that served in World War I and II. Happy New Year! A wonderfully heart warming story about a true survivor! 🙂 Thank you! I agree. This is a fabulous post. I have never heard of Sam/Oskar before. What a cat. Survivor Sam!! Me too, it was a touching story. It was, in a round about way.